Well howdy! Thanks for stopping by to read my review of the Bushnell Pro X7 Jolt Slope Laser Rangefinder. While this particular model may have been designed with golfers in mind, it sounds like it has plenty of potential for hunters, too. Let’s have a look at it and see how it shapes up. That’s all you get, unfortunately. While the rangefinder does include attachment points for a lanyard, you don’t get one in the box. What’s the Range of the X7 Jolt Slope? This is one of the most powerful laser rangefinders I’ve come across, with a range of 1 mile (1,760 yards). It’s accurate to within plus or minus a half yard, too, which is especially nice. Bear in mind, however, that these figures assume a highly reflective, large target. For something like a deer or antelope, expect to be able to range it from as far away as about 250 yards. The Pro X7 Jolt Slope offers you 7X magnification, more than I’m used to seeing in a laser rangefinder. Normally, I’d say that’s too powerful to maintain a steady shot, but the device’s horizontal orientation makes it easy to hold the device like a pair of binoculars for extra stabilization. Plus, the rangefinder includes a standard tripod mount. How Easy is the X7 to Use? One-button operation is the name of the game, here, and the Pro X7 Jolt Slope has that. Since there aren’t many features to wade through, you don’t have to press the button dozens of times to get the rangefinder to do what you want. Just point at your target, press the red “fire” button, and the Jolt Slope will vibrate to let you know it’s locked onto your target right before it displays the range. As a nice surprise, Bushnell has designed this rangefinder around fully multicoated optics with a large 26mm objective lens. The 340 foot field of view at 1,000 yards is quite generous, but the rangefinder’s eye relief is a bit short at just 19mm. On the other hand, you do get a diopter adjustment, for those times when you want to just take off your glasses and get a better view. The Jolt Slope is powered by a CR123 lithium battery, and one is included in the box. I wish manufacturers would use AA batteries instead, since those are easier to find in the wilderness, but there you have it. With that said, this model does an excellent job of managing power consumption, powering off after a short period of inactivity so that a single battery should last you upwards of a year. The main feature of this rangefinder is its speed. The E.S.P.2 technology provides for extremely rapid sensing and calculation of the distance to target. You’ll also get slope compensation, so you can find out what the true distance is to your target including vertical adjustments, not just the line of sight range. The Jolt feature, which lets the rangefinder vibrate when it has locked onto your target, is cute but slightly disconcerting. It can also generate unwanted noise when you’re stalking a deer. Fortunately, this feature is easy to turn off. What’s the Light Gathering Capability Like on the Bushnell Pro X7 Jolt Slope Laser Rangefinder? You’ll enjoy a fair bit of transmittance from the Pro X7 Jolt Slope rangefinder, since it has a large objective lens and fully multicoated optics. What’s more, the Vivid Display Technology provides plenty of contrast for low-light conditions, so I’ve found this to be one of my favorite rangefinders for use during dusk and dawn hunting times. The optics on this model are top notch, and the focus is very fast and snappy. You’ll enjoy an excellent image with plenty of detail and contrast, and the display is uncluttered and easy to read. Even more important, the included E.S.P.2 technology gives the rangefinder the ability to return your distance to target almost instantaneously. This model is both fogproof and waterproof, using RainGuard HD coatings and a rubber-armored case to make the device shock absorbent. The lenses are O-ring sealed, and the optics chamber has been nitrogen-purged. Thanks for reading my review of the Bushnell Pro X7 Jolt Slope Laser Rangefinder. 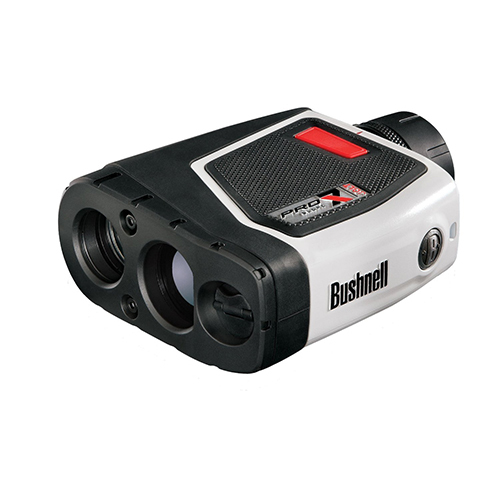 Bushnell might have intended this device for golfers, but it certainly has plenty of potential for hunters, as well. It's got great battery life, excellent display even in the dark, and has shaped up to be one of my favorite rangefinders.